Whether its one bicycle from our rental fleet on a guided cycling tour or 80 bicycles and several guided tours. We can give you the support you need to accomplish your cycling goals. We offer 45 minute to 2hour-3hour to multi-day cycling tours. We can even customize a tour the same day! Even though Born To Ride Bicycle’s head office is located in Barrie Ontario, we have serviced many organizations and events throughout Central Ontario, providing years of experience. We offer consulting and R&D. We offer training in Barrie, Horseshoe Valley, Innisfil, Vaughan, North York, Toronto, Milton, Kitchener-Waterloo, Burlington and Now OTTAWA! We offer Mobile repair services to the local home owner, remote communities, Resorts maintaining their fleet of bicycles. We offer over 90 guided tours, and now Activ-Excursions! Covering Georgian Bay, Lake Simcoe, Lake Couchiching, Lake Ontario, and Niagara-On-The Lake. The majority of our tours are within Simcoe County come up north and experience the Mecca for Cycling enthusiasts, in Ontario! Go exploring by bike! Our selection of bicycle rental and tours will let you get up close and personal with parts of the beautiful region of Simcoe County you just can't get any other way. All just 1 hour north of Toronto! 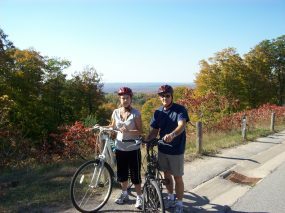 Simcoe County has some of the best cycling opportunities in Ontario. So, rent a bike for a couple of hours, the day or even longer and see what adventures are in store for you! and children's bikes and accessories. We can deliver to your location, one of our staging areas, to a desired route point or meet up with you at a designated stop along the Highway #400 if you want to take a bicycle to your cottage. 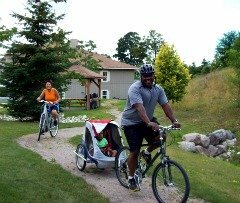 For a really unique and wonderful cycling experience, book one of our guided cycling tours along waterfront trails, beautiful country roads or forest trails. Your tour may stop at an area attraction, art studio, market or vendors along our route. You may even get a chance to pet a farm animal at a local farm! Get a real taste of Ontario with our Cycling Excursions to area wineries, breweries or chocolatiers, than consider a delicious meal at one of the area's local culinary establishments. Get off the road and into the woods with our Mountain Bike adventures and Bike and Swim Camps in some of our area's majestic forests. 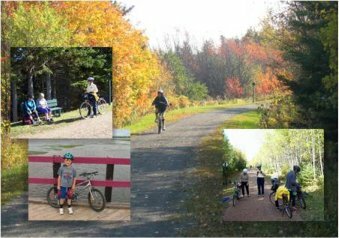 Whether you are coming up from the GTA by car or GO, staying at one of our beautiful resorts, hotels or B&B's, we have something for everyone to enjoy by bicycle in our beautiful region. Reservations are required for all bicycle rental and tours. We recommend booking at least 48 hours ahead. 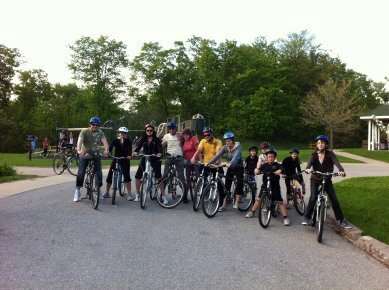 take a guided bicycle tour or even learn to ride a bike. Come for the day, the week or even just a few hours.